McGill, whose home and studio are based in Las Vegas, Nevada, works primarily with water based mediums in both large and small scales. 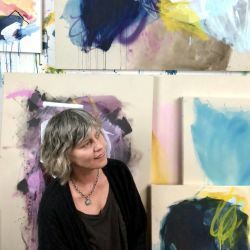 Working intuitively, her graphic works are bold and expressive pieces where the process is evident and revealed through gestural brushstrokes and luscious dripping color. Her work is both graphic and refined, with an extremely mature sense of restraint within her strong and harmonious compositions. Influenced by her background in graphic design and the natural world around her. These are personal landscapes on raw canvas and paper, influenced by the sedimentary formations of The Great Basin and the marks left behind by a millennia of water which is no longer there. The painting process mimics nature through pouring, scraping and mark making. Acrylic medium washes stain the canvas, creating depth as the layers build. Informed by a passion for color, and influenced by the Arroyo's of the desert, the rivers and creeks of The Pacific Northwest. Reflecting the joy of movement, her process involves her whole body, large strokes of colour poured or scraped across the canvas punctuated with graphic lines to guide the eye and balance the composition. Paintings are built in a very organic way. Working primarily with acrylic paints allows the work to develop intuitively. Marks and movement are added with pastels, graphite and spray paint.